But many physicians were skeptical about the evidence for the third required action—measuring lactate levels in the blood somewhere between six hours before and three hours after evidence of sepsis. One systematic review of the SEP-1 bundle, for example, concluded that "no credible evidence supports a beneficial effect on survival of mandated use [of lactate levels] for all septic patients." Editorials by several sepsis experts argued that the serial lactate measurements and fluid infusions required by SEP-1 "may not benefit septic patients and may sometimes be harmful." Once these lactate measurements were mandated, "we felt that the potential impact of this recommendation on our patients deserved a closer look," said Matthew Churpek, MD, MPH, Ph.D., assistant professor of medicine at the University of Chicago and senior author of a new study: "Implications of CMS SEP-1 and initial lactate measurement on the management of sepsis," published in the May 24 issue of CHEST. Next they looked for differences between sepsis patients who met a key SEP-1 criterion—timely serum lactate levels during the designated time frame—and those who did not. 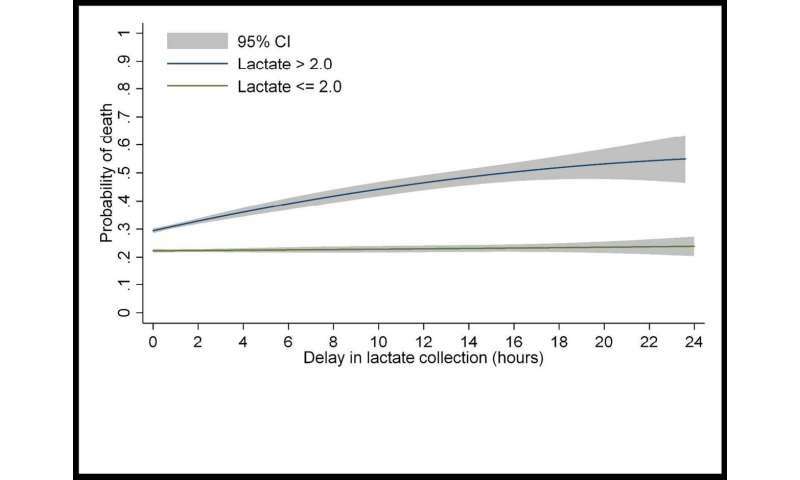 Overall, 60 percent of patients had an initial lactate draw within the specified time window. Forty-one percent of those patients had normal lactate levels, defined as less than or equal to 2 millimoles per liter. The other 40 percent of patients did not have their lactates measured during the time window established by SEP-1. Meanwhile, patients on the wards who developed severe sepsis had the lowest rate of timely lactate measurements; only 32 percent were tested within the recommended time. Many patients who did not receive timely lactate measurements also experienced delayed IV-fluid administration and antibiotic treatment—one of the few well-tested interventions that improve survival in sepsis.